The plays that made the winner-take-all match a classic! The Colegio de San Juan de Letran Knights are your NCAA Season 91 men's basketball champions! Arriba! The Intramuros-based squad defeated the mighty San Beda Red Lions in Game 3, coming up with a hard-earned 85-82 overtime win yesterday at the SM MOA Arena. The victory ended Letran's 10-year title drought and San Beda's five-year reign. Letran's top gun Mark "Ant-Man" Cruz bagged Finals MVP honors for his consistent play thoughout the series while head coach Aldin Ayo was named Coach of the Year. Letran also got a big game from Kevin Racal. The senior forward exploded for a game-high 23 points, while Cruz filled the stat sheet with 14 points, six rebounds, and seven assists. They might have come out short, but the Red Lions definitely put up a helluva fight. Art dela Cruz tallied 15 points, 13 boards, and seven dimes while super import Ola Adeogun had a double-double with 13 points and 13 rebounds. Baser Amer also chipped in 14 points for the red shirts. Letran got off to a hot start, controlling the game early with their blitzing run-and-gun offense. They closed the opening quarter with an eight-point lead, 20-12. However, the Red Lions managed to slowly get back into the game in the second period, thanks to their freethrows. They went 11 out of 15 from the stripe and entered halftime down by just one, 40-36. The game picked up the pace in the second half as both teams unleashed their respective scoring runs. Racal, who was sizzling early on in the match, continued to torch the Red Lions from the perimeter with timely threes. However, the dynamic duo of Amer and Adeogun kept the game close for the Red Lions. Letran held a 75-67 lead with under two minutes left in the fourth quarter. Feeling the urgency, Adeogun and Amer combined for an amazing 8-0 run to tie the game and send it to overtime. Both teams continued to slug it out for a nip-and-tuck affair in the extra period. Letran got the last laugh though, as the Finals MVP sank two clutch freebies with only 3.7 seconds left in the game, sealing Letran's 17th championship—their first in a decade—and ending San Beda's dynasty. Scroll on to check out Game 3's hoops-tastic highlights! The Ant-Man may be small in size, but his skills are definitely B-I-G. Just check out that epic spin move that left San Beda's defense in shambles. 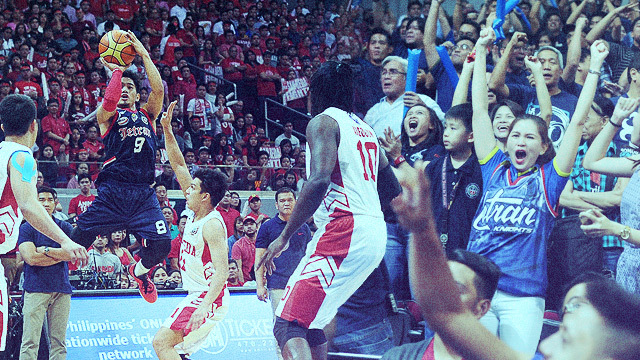 Kevin Racal's big game hunting happened just when Letran needed it the most. He scored the first basket for the Knights and continued getting buckets all game long. Not even a hand on his face can prevent him from burning the hoop. Amer showed valiant effort, making the big plays to keep his team in the fight. With less than 15 seconds remaining in regulation, the talented graduating guard stole the ball and converted a layup to send the match to overtime. Had San Beda won, this will be the play of the game. Bitin? Check out the video below for more highlights!